Broderick Stephen Harvey famous as Steve Harvey who is an American Comedian, TV host, radio personality, author, actor as well as producer. He is well-known for his professional contribution. 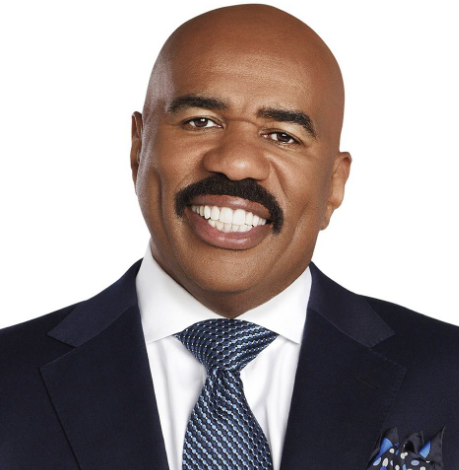 He has host: The Steve Harvey Morning Show, the Steve talk show, Family Feud, Celebrity Family Feud, Little Big Shots, and its spinoff Little Big Shots: Forever Young, Steve Harvey's Thunderdome, Showtime at the Apollo and since 2015, the Miss Universe pageant and going to host 2018 Miss Universe. He is a six-time Daytime Emmy Award winner, two-time Marconi Award winner, and a 14-time NAACP Image Award winner in various categories. Steve Harvey talk show CANCELLED by NBC after 7 years which is replaced by ‘The Kelly Clarkson Show’. Seeing as Harvey's eponymous talk show will officially reach its series conclusion in the fall of next year, NBC has already secured American Idol winner and The Voice coach Kelly Clarkson to take its time slot. For showing his witty nature and comedies on "The Steve Harvey Show", "Family Feud" and many others. 61 Years, Stephen Harvey was born on 17th January in the year of 1957. He was born in Welch, West Virginia, the U.S. His nationality is American. He is a son of Jesse Harvey, a coal miner, and his wife Eloise Vera. 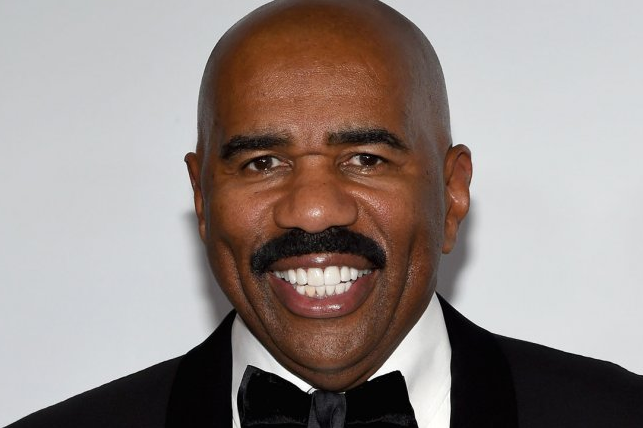 Harvey's family moved to Cleveland, Ohio, living on East 112th Street, which would eventually be renamed Steve Harvey Way in 2015. His birth sign is Capricorn. He also has a brother named Terry Harvey. Moving towards his education, he graduated from Glenville High School in 1974 and later attended Kent State University and West Virginia University. He also became a member of Omega Psi Phi fraternity. Steve has got an average body build. His body is very attractive due to which he has many fans. Talking about his body features, he stands 188 cm tall and has a balanced weight of 104 Kg. He has a very healthy and balanced body. His hair is bald and has an eye color of Dark Brown. Steve started his career as a comedian by performing stand-up comedy on October 8, 1985, at the Hilarities Comedy Club in Cleveland, Ohio. Later, Rich and Becky Liss helped Harvey with a contract for carpet cleaning and credit at a travel agency. He was also a finalist in the Second Annual Johnnie Walker National Comedy Search performing on April 16, 1990, eventually leading to a long stint as host of "It's Showtime at the Apollo". Then, his success led him to a starring role on the ABC show "Me and the Boys" in the year 1994and later on the WB network show "The Steve Harvey Show" from 1996 to 2002. He then released a hip-hop and R&B CD on a record label he founded, and also authored the book "Steve Harvey's Big Time", "Act Like a Lady", "Think Like a Man". In the year 2005, he co-starred in the movie "Racing Stripes" and appeared in the 2003 movie named "The Fighting Temptations". In the year 2008, he hosted "Disney Dreamers Academy" at the Walt Disney World Resort in Lake Buena Vista, Florida. He then performed his final stand-up act the MGM Grand in Las Vegas on 2nd August 2012. He is also the host of a weekday morning radio program, "The Steve Harvey Morning Show" which run from September 2000 to May 2005. He also began hosting Family Feud, Celebrity Family Feud, dating website named "Delightful" and later he debuted a self-titled syndicated talk show at the NBC Tower in Chicago. His new series, "Steve", premiered in September 2017, and was described as having more of a celebrity- and comedy-oriented format. He also hosted the "Miss Universe 2015" Pageant in December 2015 and in the final results he mistakenly named the first runner-up, Miss Colombia, Ariadna Gutierrez, as the winner instead of Pia Wurtzbach and later he apologised. After that, he again hosted the "Miss Universe 2016" pageant on 30th January 2017. Harvey is set to host the Miss Universe 2018 pageant in Thailand on December 16, 2018. Steve is a married man. He was married 3 times in his lifetime. He is a father of 7 children. Among 7, four are biological and 3 are stepchildren. His first marriage was with Marcia Harvey and the couple two daughters (twins: Brandi and Karli) and one son named Broderick Harvey. His second marriage was with Mary Shackelford and has a son named Wynton. The couple got divorced in the year 2005. His third marriage was with Marjorie Bridges. She became a mother of 3 children with him. The name of the children is Morgan, Jason, and Lori. Steve and Marjorie have four grandchildren: two through Jason's marriage to his wife Amanda, one through Morgan's marriage to her husband Kareem and one through Karli's marriage to husband Ben. The net worth of this famous American actor, tv host, the radio host is estimated to gave $140 Million as of 2017 and hope to be $250 Million as of 2019. He is earing a good amount of money from his professional life. He is a very success in his personal life as well as professional life. Stay tuned with us for more information about Steve. Steve’s first name is “Broderick” and is named after actor Broderick Crawford. Steve was previously a boxer. The successful comedian has also worked as an autoworker, a carpet cleaner, an insurance salesman, and a mailman.